Every day we make choices either to feel threatened by or to benefit from our partner’s strengths. Do you encourage and appreciate the strengths your partner brings to your marriage partnership? If so, it will help you through the hard times. When you’re willing to affirm each other’s strengths, you may find that some of your roughest times become some of the best times in your marriage. Here are two practical tips that will help you develop the habit of affirming your spouse. Track your positives and negatives. times as many positive as negative moments together if your marriage is to be stable.”2 Too often in marriage, the ratio of positive to negative is one to five; not five to one. What would your ratio be? Check it out. For the next twenty-four hours keep track of the number of positive and negative things you say to your spouse. Remember that five to one is just staying even. A higher ratio is much better! When we think negatively, it’s easy to express our negative thoughts, but when we have positive, tender thoughts, we too often keep them to ourselves. To develop the positive habit, begin by making a list of ten to fifteen things you appreciate about your spouse. Then every day for the next three weeks, write down five things you appreciate about your spouse. They could be thoughtful actions or qualities you appreciate about your partner. At the end of each day, share at least one or two items from the list with your spouse. Keep your daily lists and when you feel yourself becoming negative, pull them out and read them. It can change your perspective as you concentrate on your partner’s positive qualities. Keep on turning those positive thoughts into words. Think of it as a positive recycle bin. Develop the habit of praising each other. The word praise comes from a Latin word for “worth,” indicating a vital connection between the two. When we praise someone we value him or her. Descriptive verbs for praise are commend and compliment. Antonyms for praise are blame and condemn. It’s easy to see which actions will build up and encourage! Let us add our own definition of praise. Praise is describing what you appreciate. Honest praise is the opposite of flattery. Flattery is counterfeit praise. It makes the recipient feel uncomfortable and manipulated. Flattery is insincere and excessive praise, especially given to further one’s own interest. Here are some practical tips for insuring that your praise is sincere. You can have all kinds of nice thoughts about your spouse, but he or she will never know it unless you say them aloud. Couples in a 10 Great Dates small group were studying how to encourage their spouses. Most admitted that they had not developed the habit of praise. They each agreed to give their mates five compliments during the next week. At the end of the week, one wife confided, “It felt strange to hear the words come out of my mouth, but as I said them, it helped me see my husband in a more positive light.” Husbands especially need compliments. In general, men receive fewer compliments from people than their spouse receives. For instance, it’s more common for a friend or coworker to compliment a woman on her appearance. It’s awkward for men to compliment each other like that. So a woman might receive a few compliments outside of her home, but a husband is receiving compliments only from his wife. This is one reason it’s important for wives to compliment their husbands — especially on their physical appearance! Think about today or yesterday. Did you criticize your partner? Were you generous with positive words? Were those words general or specific? The most encouraging praise is also the most specific. Another tip when giving praise is to describe instead of compare. Comparison can lead to trouble. For example, you might say to your spouse, “You are the best kisser in the whole world!” In addition to being insincere flattery, this could cause your spouse to wonder, How would you know? or And just who are you comparing me with? It would be much better to say, “I like the way you kiss me.” This is honest praise, and we all appreciate getting an honest compliment. Keep the praise f lowing by writing it down. 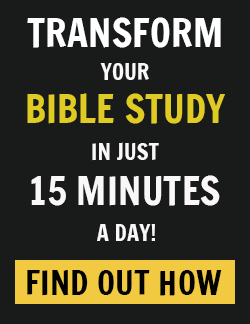 Send short emails or instant messages of encouragement. Consider leaving little notes around the house for your spouse to discover. 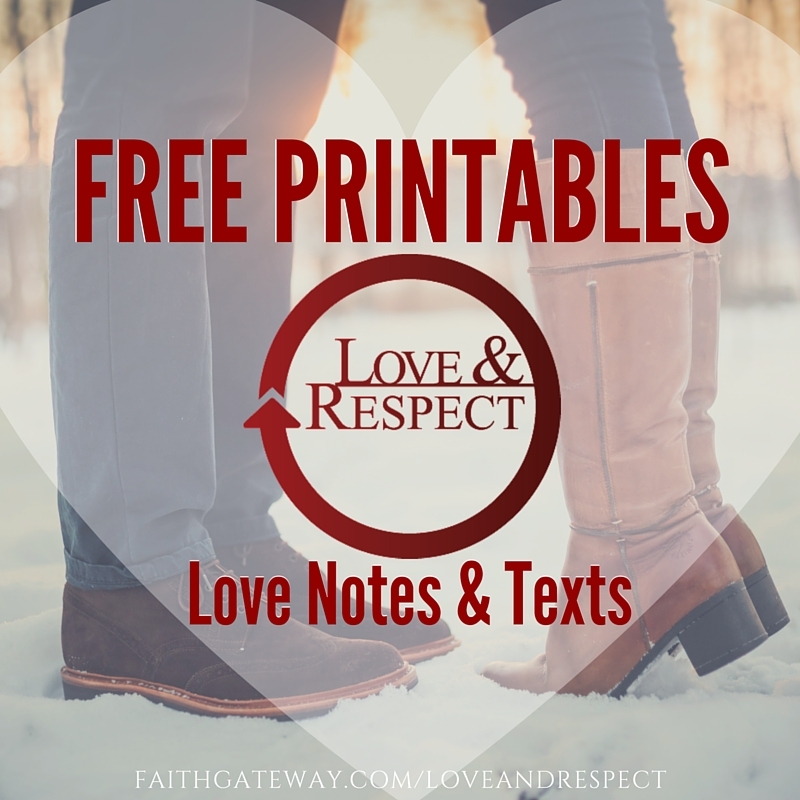 Commercial break: At FaithGateway this week we’re offering FREE download of Love & Respect text messages and printable notes. Use these sample texts and notes if you need help thinking of what to say to encourage and show appreciation to your spouse! 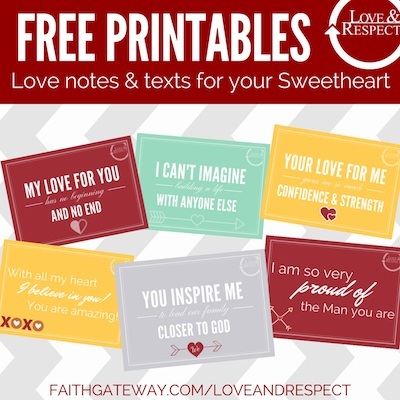 >> Get the printable Love & Respect texts and notes! Sometimes we take our own advice. We still do this stuff. Would the cute, perky, young lady who owns this car please give me a call. I think we have a lot in common and should “connect” if you get my drift. ~ From definitely an adoring admirer. It worked. I hurried home! Take the time today to write a love note and to brainstorm other ways you can encourage your spouse. Here’s what our creative friend Kelsey did to celebrate her husband’s birthday. Now it’s your turn to come up with your own ideas and strategies for encouraging each other. 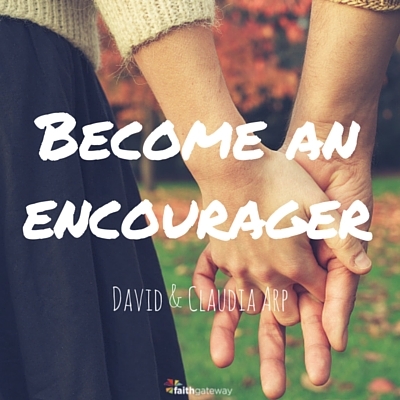 Excerpted with permission from 10 Great Dates to Energize Your Marriage by David and Claudia Arp, copyright © 1997, 2016. Have any date ideas to add to the mix? Join the conversation on our blog! We’d love to hear your date ideas and how you are encouraging your mate! And don’t forget to get the free download of Love & Respect text ideas! Claudia Arp and David Arp, MSW, founders of Marriage Alive, are authors of numerous books with more than 1,000,000 in print including the award-winning 10 Great Dates series and The Second Half of Marriage. The Arps have been featured in media like The Washington Post, The Wall Street Journal, USA Today, Time Magazine, and on NBC Today, CBS This Morning, and PBS. When they are not writing or speaking, you’ll probably find them hiking trails in Northern Virginia where they live or in the Austrian Alps where they love to write and hike. Visit them at www.10GreatDates.org. 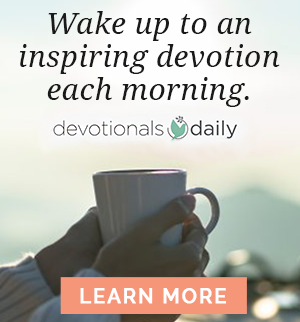 Learning to Love… Sacrificially, Passionately, and Crazily!